InterExchange is your J-1 Visa sponsor and our team is here to support you throughout your program. We are a nonprofit organization with more than 50 years of experience dedicated to promoting cultural awareness through a wide range of affordable and exciting work & travel, professional training, internship, au pair, camp, language learning and volunteer programs within the U.S. and abroad. InterExchange is designated by the U.S. Department of State to sponsor a variety of J-1 Visa Exchange Visitor programs. promote international cooperation for educational and cultural advancement; and thus assists in the development of friendly, sympathetic, and peaceful relations between the United States and the other countries of the world. 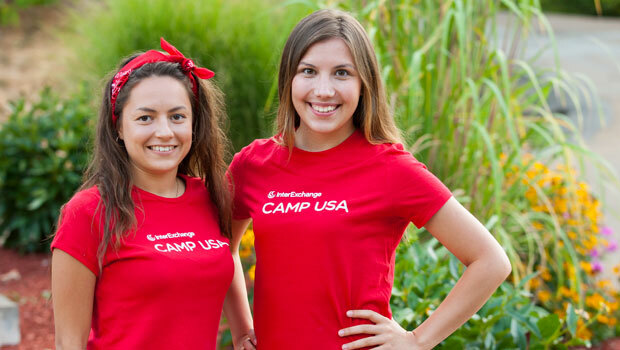 InterExchange Camp USA places international participants, ages 18-28, in U.S. summer camps in counselor positions. InterExchange also sponsors visas for returning staff or for participants who have found their own camp jobs. The Camp Counselor J-1 Visa is a 4-month visa. The InterExchange Camp USA program runs between May 15th and September 15th during the program year. This program is a fantastic opportunity to experience the tradition of American summer camp, while helping support camps with additional staff and greater cultural diversity. Au Pair USA is a 12-month program that gives young people, ages 18-26, the opportunity to experience the U.S. by living with an American host family and providing childcare. In return for their services, au pairs receive room, board, a weekly stipend, accident and sickness insurance, airfare and up to $500 to use toward college-level educational courses. This program can be extended for an additional 6, 9 or 12 months after successfully completing the original 12-month program. Career Training USA assists international students and young professionals, ages 18+, with J-1 Visa sponsorship for internships and practical training programs in the U.S. Candidates may apply for the J-1 Visa internship option if they have already secured a position in the U.S., or they may apply to be placed with an employer through the Internship Placement Program. International students and recent graduates may work as Interns and pursue an internship for up to 12 months in a field related to their academic field of study. International working professionals may apply as Trainees and pursue training programs for up to 18 months in a field related to their occupational background. To be eligible, participants' education and work experience must have been earned outside of the U.S.
Work & Travel USA offers international university students ages 18-28 the opportunity to live and work in the U.S. for up to 4 months during their summer vacation. Students work in entry-level positions at hotels, inns, amusement parks, national parks, retail stores and ski resorts. They receive a wage, assistance with housing, accident and sickness insurance, program support and an optional month for travel to explore the United States. Work & Travel USA also offers a 12-month program for citizens of Australia and New Zealand. Working Abroad enables U.S. citizens, ages 18-30, to experience diverse work experiences overseas. Opportunities include Au Pair, English language instruction, work and volunteer abroad placements. We offer programs in Australia, Africa, Asia, South America and various European countries. The InterExchange Foundation was established in 2007 to provide grants to motivated young Americans who want to contribute to worthy work or volunteer abroad opportunities. The Working Abroad Grant supports participants of select InterExchange Working Abroad programs, and the Christianson Grant supports individuals who have sought out and arranged their own work abroad programs. Many students study abroad every year, but far fewer take advantage of the opportunity to work, intern, or volunteer overseas. By providing financial assistance to talented candidates, we encourage young Americans to discover and contribute to the world and benefit from the unique and enriching insights one can only gain from living and working abroad. In addition to providing ICs with detailed information and guidance for marketing our programs in their home countries, we also provide content for orientations to teach participants about life in the U.S. and prepare them for adapting to a new culture and country. Each in-bound international participant is interviewed by either InterExchange staff or an IC to evaluate the candidate's ability to be successful on the program. Final acceptance to the program and program monitoring are exclusively the responsibility of the sponsor. Every IC is an important part of the process for making sure that all participants are equipped for the benefits as well as the challenges of joining one of our cultural exchange programs. InterExchange makes it a priority to ensure that all our participants enjoy a safe, healthy and well monitored cultural exchange experience in the U.S. The following information describes a baseline for conduct that our participants can expect from InterExchange and their hosts as well as their responsibilities during their visits to the United States through InterExchange programs. We're happy to say that the majority of our participants and hosts regularly make an extra effort beyond these standards to create a truly memorable, life-changing cultural exchange experience for everyone involved. A safe, healthy and legal work environment. A safe, healthy and legal living situation. Opportunities to interact with Americans on a regular basis. Protection of their legal rights under United States immigrant, labor, and employment laws. Fair treatment and payment practices. Right to keep passport and other documents in their possession. Right to report abuse without retaliation. Right to contact the J-1 Visa Emergency Helpline of the U.S. Department of State. Right not to be held in a job against their will. Right to end their programs and return to their home countries. Right to request help from unions, labor rights groups and other groups. Right to seek justice in U.S. courts if warranted. Emergency assistance 24 hours every day. Serving as a reliable resource for general information. Resources and guidance to help them engage in cultural learning and American daily life. At a minimum, monthly contact and monitoring. Vetting and conducting due diligence to verify each host employer or host family. Available staff with extensive international experience and language skills. Available staff who can provide support for special situations if needed. Acting as a neutral advocate to help resolve any disputes that occur. Accident and Sickness insurance that meets or exceeds J-1 Visa regulatory requirements. The primary purpose of InterExchange cultural exchange programs is to interact with U.S. citizens, practice the English language, travel and experience U.S. culture while sharing their culture with Americans. They will abide by the laws of the United States. They will abide by all rules and regulations applicable to U.S. Department of State Exchange Visitor programs. They have not come on a J-1 Visa program seeking permanent residency or employment in the U.S. They are expected to follow the guidelines of employment provided by their host employer or host family. InterExchange is their visa sponsor. A U.S. host employer or host family is not a visa sponsor. Any wages earned during the programs are only meant to help defray living expenses during the programs. Earning money is not the primary purpose of cultural exchange programs. Host employers and families may terminate their employment relationship with participants. Host employers and families do not have the authority to cancel the J-1 Visa. Only the U.S. Government or InterExchange has that authority. They must contact InterExchange in the event of an emergency or if any problems occur during the program. They will respond to all requests and inquiries sent from InterExchange. They are required to leave the United States at the end of their programs.